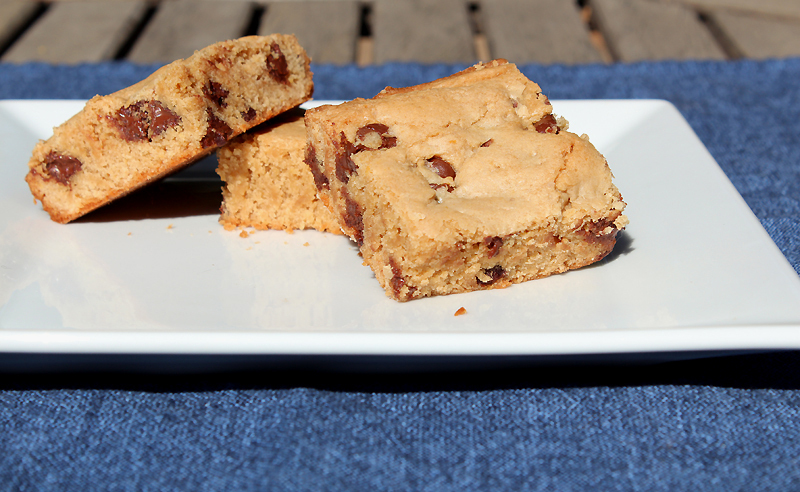 Happiness Project Recipe #18: Peanut Butter Chocolate Chip Brownie Bars! In all of my 34 years, one of the things I’ve learned most about myself is that once I set my mind (or heart) to doing something, I do it. With 110% of my entire being. And I tend to like to do things on my own, without needing to rely on the help of anyone else (yes, I can most definitely be quite the stubborn perfectionist at times). But since becoming pregnant, I’ve had to re-learn the importance of asking for a little bit of assistance every now and then, particularly in regards to certain physical activities, like carrying full bags of groceries or moving my trusty (& quite heavy) Kitchen Aid stand mixer from one counter to the other (thanks be for a wonderfully helpful husband!). There are, after all, certain things that a pregnant woman should not be doing on her own, as I’ve been repeatably (& lovingly) reminded. So after gathering up all of the paint supplies I needed for re-painting our master bedroom this weekend, my sister threw another pregnancy “No, No” my way. When pregnant, there will be absolutely NO painting! Of any kind! Which pretty much threw my whole “I will paint the entire master bedroom on my own (by choice) this weekend,” plan askew. Therefore meaning that my Imzadi would have to do the entire bedroom on his own, without me. The catch, you ask? I happen to really LIKE painting whereas my Imzadi most decidedly does not. Hence the dilemma. So what did I do as soon as I got home & was able to freely & legally text again? I issued a “need help” plea to some of our closest friends. And true to form, these friends rallied selflessly to the cause. So as a THANK YOU to our wonderful friends for volunteering to help my Imzadi paint our bedroom tomorrow morning, I did what I do best whenever my cup runneth over. I baked up a little something special, just for them. My THANK YOU recipe? Peanut Butter Chocolate Chip Brownie Bars! Because who doesn’t like some peanut butter with their chocolate?? I do! Yes, yes, I do! Grease or spray a 9X9 inch baking pan with butter. Dust lightly with flour, gently tapping out the excess (preferably over a sink to alleviate a potentially messy cleanup). Preheat your oven to 350F. In a stand mixer (or by hand, if you’re prepared to use some elbow grease), beat the eggs and both sugars until smooth. Add the peanut butter and continue mixing until well combined. Beat in the vanilla and butter and mix until thoroughly incorporated. Once you’ve measured out the flour, baking powder and salt, sift all three directly into the batter. Mix gently on a low speed until well combined and no trace of the dry ingredients remains. With a wooden spoon, stir in the chocolate chips by hand. Now, using a rubber spatula, pour the dough into the prepared pan and spread out the entire batter by gently pressing and finessing. The batter will be quite sticky so keep pressing until you reach a desired evenness. Bake for 23-25 minutes until the edges start to brown slightly and the center is springy to the touch. Remove from the oven and let cool on a wire rack for 45 minutes to 1 hour before cutting up into bars. Quick tip: using a serrated or small pairing knife is ideal when cutting up even shaped bars. This will make you approximately 12-16 bars. If not consuming immediately, you can store them in your fridge in an airtight container for up to 3 days. « Happiness Project Recipe #17: Cinnamon French Toast Niblets!